Quicker Wicker is just what the name implies - a fast, easy, economical alternative to handmade wicker. 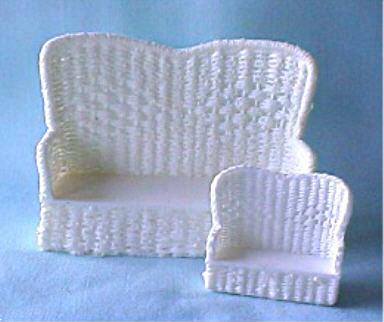 Instead of spending hours weaving the furniture, you will merely clean the pieces, paint, and dress them. Certain pieces require you to insert wire legs and wrap them with cord, add knobs to drawers, or, as in the case of the baby carriage or teacart, assemble the undercarriage. I designed and hand wove each original piece then made molds and cast them in resin. 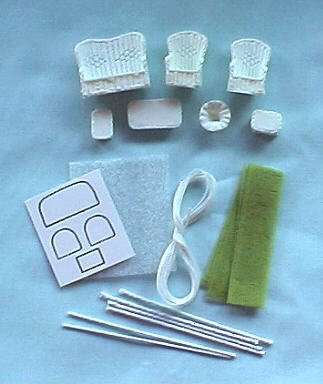 Below is an example of what you will receive with the 1/4" Diamond Back Furniture Kit. seat cushions, and cardstock seat patterns. Photo of unfinished 1/2" and 1/4"